There are perfumes in my collection I reviewed very early on, there are reviews on my blog, of perfumes that never made it out of sample status, and there are bottles in my closet, I have loved, worn and cherished for years, but for some reason kept mum about. Vol de Nuit is one of the latter category. I guess I did not review Vol de Nuit for so long, because I find it hard to put into words what is is, how it smells, how I love it. Sadly, this is not the bottle I have, but the one I aspire to. Vol de Nuit was created in 1933 by Jacques Guerlain and includes notes of bergamot, galbanum, petitgrain, jasmine, daffodil, spices, woods, iris, vanilla, amber and forest notes. Another notes list reads: Orange, mandarin, lemon, bergamot, orange blossom; jonquil, aldehydes, galbanum; vanilla, spices, oakmoss, sandalwood, orris, musk. Stil another has the following notes: orange, bergamot, lemon, mandarin, petitgrain, galbanum, sage, aldehydes, violet, rosewood, palmarosa, jasmine, daffodil, pimento, vanilla, benzoin, Peru balsam, musk, cedarwood, orris, tonka bean, oakmoss, agarwood, sandalwood, vetiver, ambergris and castoreum. 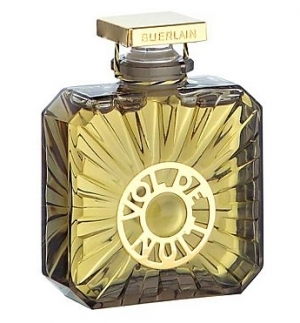 This is the refillable Habit de Fete bottle of EdT I have. Its history can be best read on Bois de Jasmin and Perfume Shrine. I also like this review on Yesterday’s Perfume. My bottle of EdT is from before 2000, I’m no expert whatsoever when it comes to vintages and reformulation and when what took place, but I believe my bottle is still pre-reformulation. See a review of the extrait by Tara here. It is not that Vol de Nuit is the best perfume I ever smelled, far from it. But still – Vol de Nuit has a special meaning. It was the first Guerlain classic I fell, for and I’m still of the opinion it is one of the most accessible. Let’s hear a musical version of Vol de Nuit, that is how it smells to me: a familiar theme interpreted in an interesting way, it sticks with you and it is almost unbearably beautiful. Vol de Nuit EdT opens with a fresh citrus accent that stays for a long time and is slowly getting greener and greener, bolstered by galbanum. The floral heart is well blended, I can discern orange blossom and jasmine, infused with spicy notes on a dominant oriental bed of ambery-mossy woods. Vol de Nuit touches me. It makes me feel elegant and wordly, but not in a “lady” kind of way. It is warm and comfortable, the word that comes to mind again and again is timeless. Vol de Nuit is transporting me to another time and place. A place outside reality, Vol de Nuit is a night flight into a world of dreams and fantasies, a means of escape. Vol de Nuit flies me through the night to wherever I want to be, to whatever I want to be. Vol de Nuit leaves all possibilities open. Unlike real life, Vol de Nuit never closes a door in your face. Having such a place in your heart and knowing where to find it, is all that matters. This entry was posted in Amber, Chypre, Citrus, Fragrance Reviews, Green, Guerlain, Iris, Jasmine, Oriental, Spicy, Vanilla and tagged Fragrance, Guerlain, Perfume, Review, vol de nuit. Bookmark the permalink. OMGosh, I have been transported with you…. I cannot imagine, having never sampled or sniffed..
How wonderful you have your EDT, and someday you will have that gorgeous bottle! Thank you, Judith! I hope you get to smell VdN soon! Such a beautiful, lyrical review! You manage to put into words what I can’t. It is “almost unbearly beautiful” and that Dali image is amazing. The very best perfumes do indeed transport you somewhere else and provide a form of escape. “Having such a place in your heart and knowing where to find it, is all that matters.” Beautifully put, Birgit. VdN certainly has a place in my heart. Thank you for another great review. Sorry, I somehow overlooked your lovely comment, hence the late reply! I’ve never tried VdN, but it’s one of the few scents which notoriusly occupied my mind recently. VdN should be sniffed very soon ! I’m looking forward to hearing your opinion! Two very evocative reviews of Vol de Nuit in a row … I loved them both and must spend some more time with VdN to see if I can be transported too. Lovely review and images, Birgit! Thank you, Suz! I should not forget to send you some EdT next time! And you should know I went “Yaay! The Piano Guys!” when I saw the video. The teenage Wild Things introduced me to them, and I really like their work. VdN can be unassuming at first smell, but has a way of growing on you. I’m still on the phase of love/hate with VdN but I suspect it will get into my collection at some point because I just do not want NOT to have it. The biggest problem now is that EdT concentration (current) doesn’t stay on my skin long enough to reward me for the first 30 minutes during which I can barely stand it. And parfum is so expensive that it’s hard to justify buying it before I got into my collection all those perfumes that I love/like without a struggle. If a half hour is a real struggle ALL the time, I wouldn’t be able to live with it. But maybe it is just a question of learning to love, as I experience it very often. Then it does make sense to persist of course. In the long run, my favorite perfumes are the ones I didn’t immediately fall for. I’ll let you know in a year 🙂 But, as I said in Tara’s post, maybe I should look into finding a vintage bottle. I find the vintage a lot better as well. 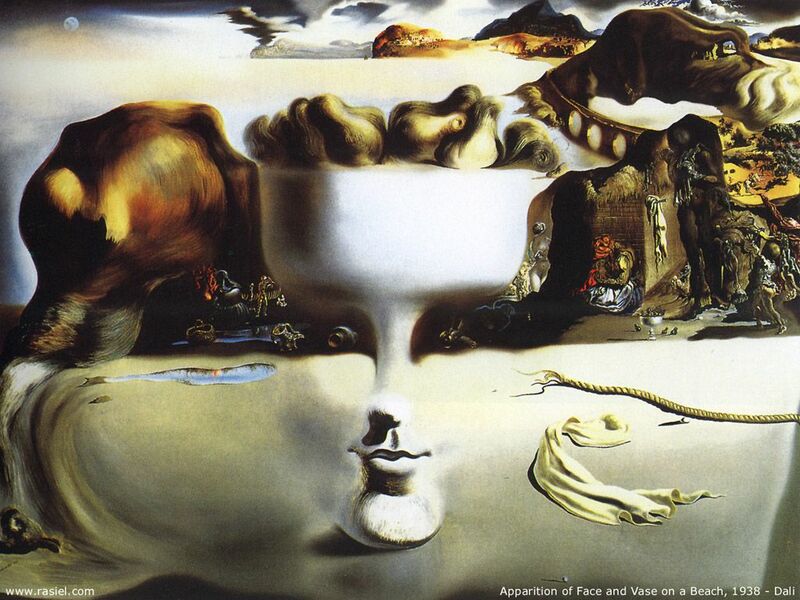 Love that Dali image! It has all the colours I associate with this scent, olive green being key, obviously. Great review of a scent I do respect and occasionally get around to wearing. I must say, contrary to expectations my natural aviating instincts have not yet been triggered by Vol de Nuit. The transporting taking place, can be compared to Star-Trek like beaming rather than old-fashioned double-decker flying. Such a beautiful review, Birgit! And I did not know about The Piano Guys until now. I enjoyed the music a lot too! It’s lyrically obvious you really love it and that’s so delightful. It fully deserves the love; especially the extrait version in the propeller bottle is a thing of beauty. Historically inclined (thanks for linking), I think a “disservice” was made to it in that it was brought out after two legendary releases by Guerlain; of course we can’t really complain!! Thank you very much, Elena! The unusual presentation of “Nearer my God to thee” especially draws me in. Thank you for finding words for what I feel about this perfume ;-). I’m glad to hear you share the feeling.